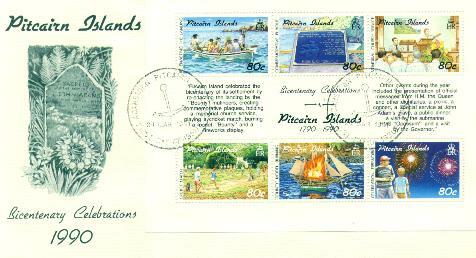 Many of Pitcairn's bicentennial celebrations took place early in 1990, and most were concentrated between 15 January, the day of the Bounty's arrival, and 23 January when the vessel was burned. Joining in those January celebrations with the Pitcairn community were a number of visitors. At times the island's population more than doubled as vessels came and went. Over a two week period calls were made by two yachts, a French naval tanker, two cargo vessels, two square riggers and an 82 year old converted Danish lighthouse - the latter carrying 30 visitors including a party of ex-patriate Pitcairners from the USA and New Zealand together with a dedicated group from Norfolk Island. a model "Bounty" and a fireworks display. Other events during the year included the presentation of official messages from HM the Queen and other dignitaries, a picnic, a concert, a special service at John Adam's grave, a public dinner, a visit by the submarine HMS "Opossum" and a visit by the Governor." Hopefully this will dispel the doubts of any who wonder whether the Pitcairnese is alive and well on Norfolk Island! Bicentennial events later in the year also held special significance for Pitcairn. Due to an extremely busy schedule the Governor was unable to join the January celebrations but his visit in March enabled people to discuss local problems and to examine possible future development projects. As guests of the British government Brian Young, the Island Magistrate, his wife Kari and children Timmy and Annette - on holiday in the USA at the time - were invited to London where Brian and Kari attended a garden party at Buckingham Palace and were introduced to Her Majesty the Queen. Brian and Kari represented the Pitcairn community on this occasion and their visit was part of the official bicentennial celebrations. Another one of the year's highlights was the visit of Her Majesty's submarine Opossum which spent two days at the island in September. This was a memorable experience for all concerned; crew members took turns staying ashore with local families and participating in a number of activities. Opossum's engineers attempted to repair one of the local compressors and although they were unsuccessful their efforts were greatly appreciated. Philatelically Pitcairn has prospered with the issue of three souvenir sheetlets and a tripartite sheetlet produced in conjunction with Norfolk Island and the Isle of Man. The Bicentenary Celebrations sheetlet completes the set which we hope you found attractive and interesting.